Happy Mask Wednesday everyone! This week was my 30th Birthday, and what better way to celebrate than with a special birthday mask?! Maskingdom I Wish "Happy Birthday" Face Mask ~ $7.00. Spread the love of sheet masking and bless your loved ones with sheet mask from the Maskingdom I Wish series. Each mask contains natural extracts to care for their skin, and wishes to touch their heart. With each blessing, sheet masking can make the world go round! Each mask is made from 100% natural Japanese silk, both thin and form-fitting to deliver an abundance of moisture and nutrients deep into your skin. 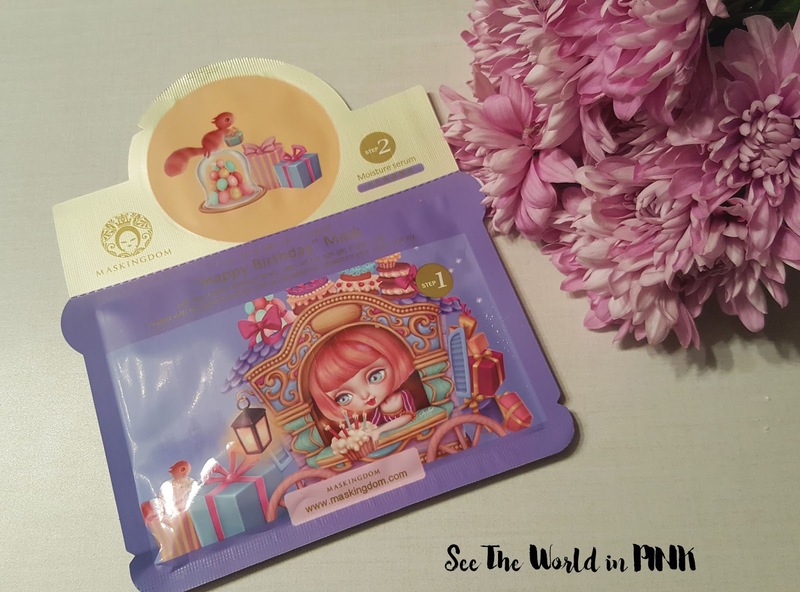 Maskingdom is a T-beauty mask brand - their masks are all silk and I have heard that they are amazing on the skin! This mask is a 2 Step mask - the first step is the sheet mask and the second step is a moisture serum. The Happy Birthday mask is described as "just like flowers blossom every year, let not age get in your way. Added with the jasmine extract and caviar essence, recapture your youth and joy". This mask is straight-forward to apply: wash face, tone skin, apply face mask, leave on for 20-30 minutes, remove mask, pat remaining essence in to the mask, apply the step 2 moisture serum, and complete skincare routine. 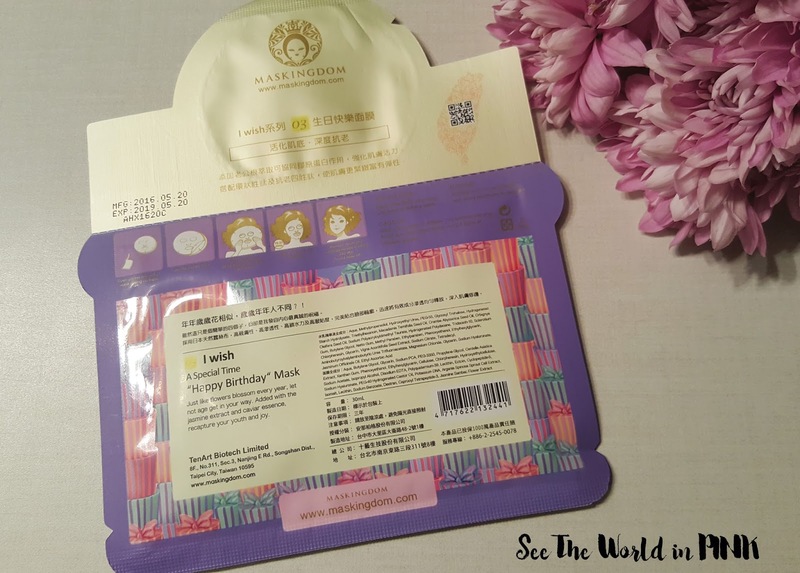 This sheet mask is drenched in essence - the mask fits very well! It adheres well to the skin and lasted for a long time (for 45 minutes!) I really enjoyed this mask - it made my skin feel very hydrated and refreshed! After the sheet mask is removed, the step 2 moisture serum is applied. This package had a very generous amount of serum and there was a lot of serum! This made my skin very moisturized and I was really happy with this! 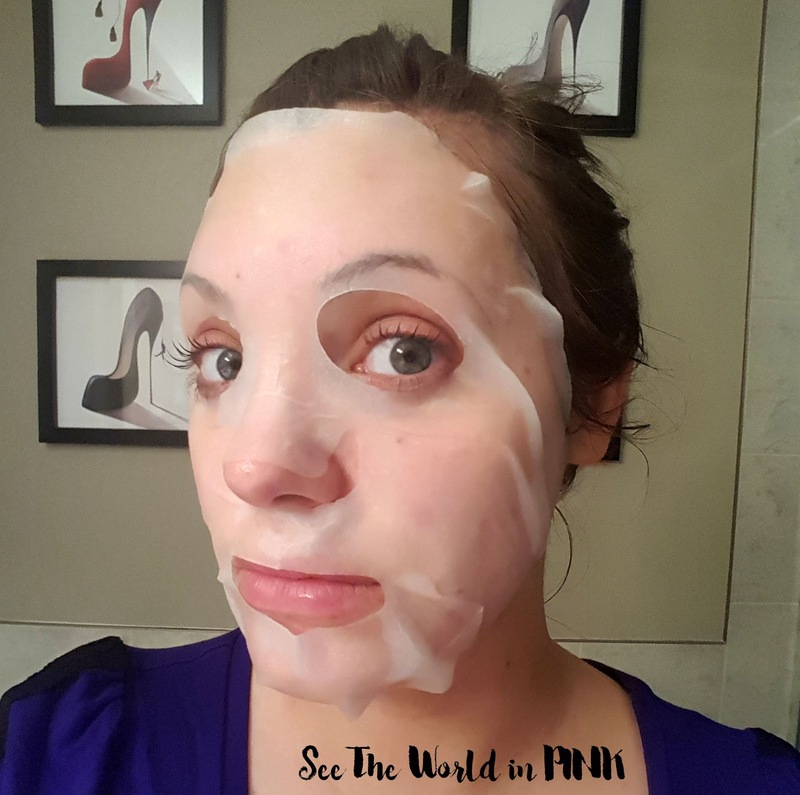 Overall, I was very impressed with the Maskingdom mask - it was so soft and smooth and moisturizing on my face! It felt very luxurious and it was really what my skin needed after a long break from masking! Belated happy birthday! This mask sounds amazing, wish I'd had one to ease the pain of turning 30 lol!! Thank you! I have been loving Maskingdom masks - they are really great! Definitely made me feel better about turning 30!